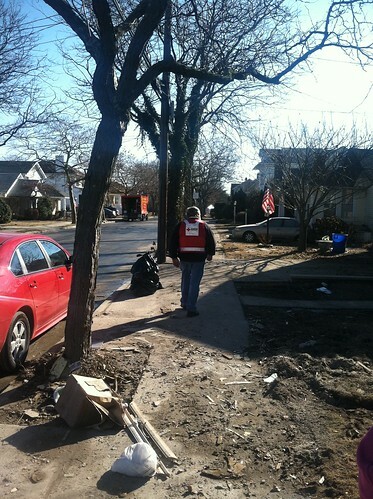 This blog post was written by Eric Kilz, a Red Crosser deployed to help with Sandy relief efforts in New York. Breezy Point, a quiet picturesque neighborhood located on a peninsula in the south of Queens, never looked like the rest of New York City. As a private community, it hosts three of the few remaining volunteer fire departments in the New York area and its own private security force. When Hurricane Sandy blew into New York, Breezy Point faced stress as it never had before. Our public affairs team arrived in the morning of Nov 13 to document the work done by the Red Cross and the role the agency is playing in the communities’ recovery. After refueling at a FEMA fuel point due to ongoing fuel shortages, we hoped the 10 gallon limit would allow us to complete our day’s mission and make it back to headquarters in Manhattan. Our trip was worth it. We encountered some amazing people in this neighborhood: residents, volunteers, emergency workers and the people already trying to rebuild their lives. With a 97 percent volunteer workforce, large disasters such as Hurricane Sandy usually require Red Cross workers dispatched in from all over the nation. The Emergency Response Vehicle from Oregon that we encountered was a perfect example of Red Cross workers’ dedication. We followed it as it snaked through police roadblocks, debris and mud-covered streets in its mission to bring hot food to cold people. The ERV made on particularly noticeable stop in the parking lot of a restaurant called Kennedy’s. Kennedy’s restaurant has received outstanding reviews online reviews and had been a focal point in the community featuring incredible views of the Manhattan skyline. When we saw it, it was covered in discarded appliances and furniture. A look inside revealed a floor covered in sand, walls covered in mold. One woman I spoke with, a heartbroken owner of the restaurant, and told me through tears how the restaurant had been her family’s livelihood for years. When asked if she would re-open, she seemed unsure. The parking lot of Kennedys was as a drop off point for supplies donated by the community. It was a rainy day so a frantic effort was being made to cover the supplies with tarps. Sometimes in a disaster, we focus so much on the larger issues like food and shelter. But sometimes, just the little things can make someone’s day, such as the man who arrived to find a roll of toilet paper – the stores had been out for weeks, he said, and was immensely grateful. This man told us that he had been to other disaster sites with another organization so was happy to see help coming in to his neighborhood. His home had one-and-a-half feet of water at the height of the storm. Another woman told us her extended family had been staying at her house – she now had 8 people living with her. We helped her load up with water and canned food. She still had no electricity or gas service. Spiritual Care is an assistance many people don’t realize the Red Cross offers. A nondenominational service, the Red Cross recognizes its clients have their own urgent religious and spiritual needs in a disaster. We met two volunteer chaplains who had spent the previous day in Breezy Point and who took us on an impromptu tour. They told us tales of clients breaking down over the loss of their homes, yet experiencing relief at finding a remaining photograph or other small memento. Breezy Point citizens seemed grateful for the Red Cross chaplains’ visit, if only to use them as a sounding board to share their emotional experiences. We walked many impassible side streets during our tour of Brooklyn. In the cold, wet weather, the streets were a hardship faced by all, including two men pulling a pump in a children’s wagon so they could remove the water from their home. Debris was everywhere, but debris was only part of the problem. The hardest obstacle was the sand. Sand was virtually everywhere: covering streets, burying homes thousands of feet from the beach, immersing yards. It was impossible to get close to the homes to offer help – to even take pictures. The most heartbreaking and poignant place we visited was our final stop. At some point during the storm, a fire started in a home and it quickly spread to more than 100 surrounding houses. The local volunteer fire department was unable to reach the fire due to the storm – neither could the New York Fire Department. Entire blocks of homes burned down to their foundations. Little was left that was recognizable. Many of these homes were summer homes – those owners would at least have a place to go. Not all of the homes were summer homes, though – several inhabitants were there sifting through the rubble. Hurricane Sandy produced countless stories of heartbreak and hope. There are many images of people of people helping one another hand-in-hand. One image that will remain in my mind for a long time is that of a smoldered fire hydrant with a freshly painted American Flag in the background. New Yorkers are a resilient people; they have encountered much adversity. One lesson I have learned is that New York will always be a great American city – it will rebuild, and it will come back better than ever.